Moving effortlessly between musical genres, projects, and influences, pianist-composer Ron Davis has established himself as one of the most original, enjoyable voices in jazz today. Ron is active on the worldwide jazz scene and has built a dynamic career including several successful international tours. He cites piano giants Oscar Peterson, Art Tatum and Thelonious Monk as inspirations, but his clean, energetic, joyous playing style is uniquely his own. Ron is the unusual combination of a virtuoso pianist and an entertainer. He reads audiences and really connects, creating a multi-textured musical mix that keeps listeners on the edge of their seats. On any given night, Ron's set list might include classic Tatum alongside Coldplay, James Taylor, Bill Withers, or Bebel Gilberto. The result is a magnificent mélange of instrumental and experimental music, and as importantly, an unforgettable evening out. Ron has released seven full-length recordings to unanimous international critical praise. He recently released two new titles—Blue Modules, an experimental musical project exploring post-modern jazz, and Symphronica, an innovative jazz-symphony fusion album made with the Windsor Symphony. himself a student of classical great David Saperton and jazz legend Oscar Peterson. When his isn’t wowing audiences around the world, Ron sits on the boards of several charities (he is Past Secretary of The Glenn Gould Foundation,) publishes articles on music, law and linguistics, and practices yoga. He is married to the lovely and highly-hyphenated Daniela Nardi, the award-winning, Italian-Canadian, singer-songwriter of jazz-pop with whom Ron co-produced her acclaimed Espresso Manifesto recording. The couple call Toronto home. Born in Winnipeg , bassist Drew Birston studied jazz at St. Francis Xavier University and McGill University. Drew has toured Japan, Indonesia, China, Germany, Canada and the US with various artists and groups including Lava Hay, The Leslie Spit Treeo , Wild Strawberries , Melanie Doane , Sarah Slean , Hayden , Chantal Kreviazuk , Justin Hines , The Immigrants, Sarah McCully , Lori Cullen , Kurt Swinghammer , The Supers and others followed . Maintaining a love of jazz , He has also recorded and toured with good friends Kevin Barrett , Peter Smith , Melissa Boyce , Ron Davis , Steve Koven and the Worst Pop Band Ever. Drew is a member of Sultans of String, currently working on their fifth CD with sitar virtuoso Anwar Khurshid. One of Drew’s most important collaboration is his wife singer/songwriter Amanda Martinez whose music is available at amandamartinez.ca. Born and raised In Toronto, Glenn has been performing on the Toronto music scene for the past three and a half decades. 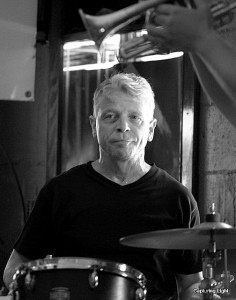 He has developed a musical reputation as a hard swinging, yet dynamically sensitive drummer. Glenn plays with Canada’s best known jazz artists and has performed with nearly every traditional jazz band in Toronto including The Excelsior Jazz Band, Dinny & The Allstars, The Hot Five Jazzmakers, The Ragweed Jazz Band, The Hot Peppers, The Dixie Demons, Up Jumped Swing, The Climax Jazz Band, Pianist Jordan Klapman, Bertie & The Gents, and The Magnolia Brass Band. In 2011, Glenn teamed up with a half-dozen of Toronto’s hottest jazz musicians as “Red Hot Ramble”. Their Debut Album Entitled ‘Red Hot Ramble’ is available at www.redhotramble.ca. Kevin Barrett is a guitarist, band leader, musical director, producer and composer based in Toronto, Canada. Over his 25-year career he has worked with some of Canada’s finest artists, including Molly Johnson, Lillian Allen, David Wall, Julie Michels, Kellylee Evans, Cindy Church, Daniela Nardi, Big Rude Jake, DK Ibomeka, Clifton Joseph, Lisa Lindo, Rebecca Campbell, Julie Crochetiere and Jaymz Bee’s Royal Jelly Orchestra. He leads his own contemporary jazz ensemble, which has released two CD recordings: Kevin Barrett Trio: "JAM" (1999) and Kevin Barrett Group: "Share the Wealth" (2002). Both have received critical acclaim and considerable local and national airplay. Kevin has performed, as a leader and side-musician, in jazz festivals, clubs and concert venues across the country, while maintaining a continuous presence on the Toronto scene. He is also known for his versatility as a side musician, playing jazz, pop, rock, reggae, blues, country, folk and classical music in a wide variety of settings. He also teaches, both privately and in workshop settings. Kevin is currently freelancing in Toronto, maintaining a busy schedule of live gigs, touring, recording and producing.